Welcome back. Did you see last Tuesday’s Waiting Animals Photo Addendum, the last photo, the one of a turtle? I saw its feet and guessed it was a turtle not a tortoise. Turtles are mostly aquatic with a swimmer’s webbed feet and streamlined body; tortoises are mostly terrestrial with stubby legs and no webbed feet or streamlining. It’s confusing because “turtle” and “tortoise” as well as “terrapin” are often used interchangeably. Taxonomically speaking, turtles and tortoises are reptiles in the order Testudines. Although there are turtle species with terrapin in their name, there is no “terrapin” taxonomic unit (just University of Maryland teams). Why the fuss? There was a very cool study of red-footed tortoises and touchscreens I wanted to tell you about. Why the emphasis on navigation? Reptiles lack a hippocampus that, in the human brain, is associated spatial navigation and spatial memory in addition to memory in general--particularly long-term memory--and behavioral inhibition. 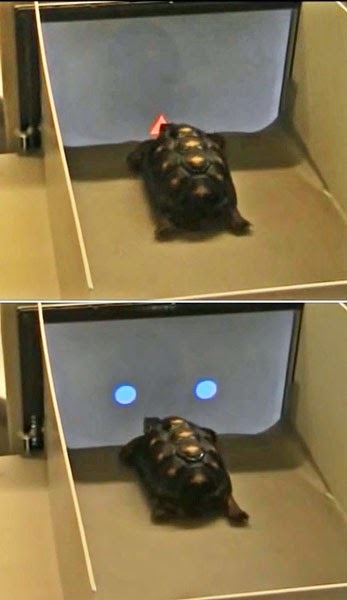 Using treats such as strawberries, the investigators taught four tortoises to nose-poke a red triangle in the touchscreen center, which caused two blue circles to appear, one on each side. To be rewarded, the tortoises then had to poke consistently the circle on the left or right. To test whether the training could be transferred from touchscreen to reality, two of the tortoises were placed in an area with two empty blue food bowls that looked like the touchscreen’s blue circles. The tortoises went to the bowl that was on the same side as the circle they poked on the screen, indicating that when navigating in real space, they do not rely on simple motor feedback but learn about the position of stimuli within an environment. To rule out the possibility of the choice of bowls being the result of a preferred side, the investigators trained the tortoises to go to the opposite bowl. When given the same touchscreen test three months later, the tortoises still poked the circle on the same side as in their initial training. Not having a high regard for reptile intelligence, a notion I’m now forced to revisit, I was impressed by the study results and would like to see further testing with at least more tortoises. 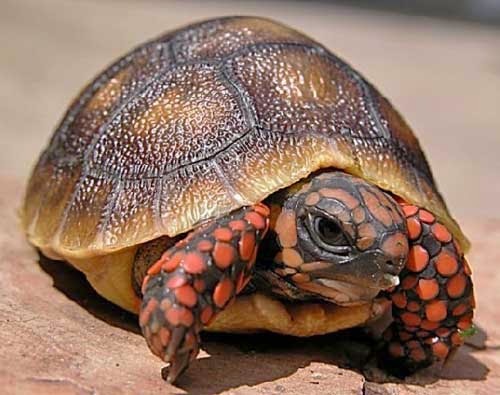 I was even more impressed by one investigator’s comment that red-footed tortoises are inquisitive and learned to use the touchscreen as fast as pigeons and rats, and--get this--faster than dogs. No comment regarding cats, of course. Thanks for stopping by.